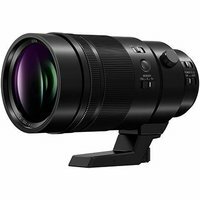 The Lumix 200mm f/2.8 Leica Elmarit Power OIS offers edge-to-edge sharpness unrivalled by anything Panasonic have produced before. When coupled with a wide aperture of just f/2.8, the 200mm (400mm equivalent) focal range is ideal for wildlife, portrait, and sports photography. Power Optical Image Stabilisation also ensures the Lumix 200mm f/2.8 is ideal for both stills and 4K video work.